An armada of specialists and fitters take 14 days to spruce up the Porsche Arena and Schleyer Hall for the Porsche Tennis Grand Prix. It's understandable that the heart of an event is delivered by excavator, especially in the city of large construction sites. There's no other way to do it: 60 tonnes of brick chippings must be laid evenly so that the best tennis women in the world have solid ground under their feet. This is one of the main reasons why the Porsche Arena is under a state of emergency at the beginning of April every year. Although the brick chippings carry the greatest weight in all the immense construction work, it is only part of the work. There is an ultra-large screen, displays, cable, floodlights and technical equipment. Then come the race cars, sports cars, furniture, exhibition stands and advertising banners, not forgetting the lamps, wings, an extensive catering area plus a complete restaurant built among the spectator tiers. Gradually the Porsche Arena and the neighbouring Schleyer Hall are filled with everything that is needed to create an appropriate setting for a top event such as the Porsche Tennis Grand Prix. "The great art of organisation is to coordinate all the trades together," said Vjeko Curic, who is the organisation team member responsible for the sectors of Sales and Operations, and therefore for a greater part of the modification work. Time is running at a premium. Two weeks are not much time to turn two large halls into a temple of tennis, where otherwise Nickelback rocks the plaster off the walls or Helene Fischer makes young mens' heads spin. Every year, about 50 companies are involved. One of them is CONICA AG from Schaffhausen. The Swiss company developed the CONIPUR PRO CLAY clay court and has further optimised it since it debuted in 2009. The base course of brick chippings is only 2.5 centimetres thick and is mixed with a binding agent which retains moisture without adding any water. A special machine compresses the layer to form a flat, hard and resistant base which then receives a layer of brick dust. It takes 48 hours to produce each of the three courts. The installation work is something similar to road-building, and this is where the court surface finally ends up. After the tournament, it is removed from the hall as quickly as it was installed and is then reused since it is fully recyclable. But before that happens, women players will appreciate its excellent playing qualities which come very, very close to those of the centre courts in the French Open. 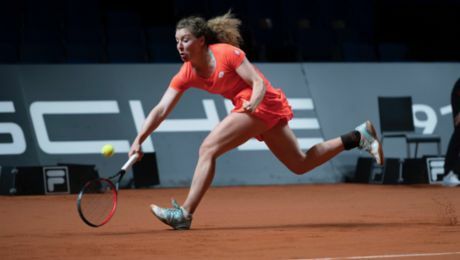 That is why Stuttgart is highly rated by professionals as excellent preparation for the Grand Slam classic event in Paris and guarantees the Porsche Tennis Grand Prix its unique position as the only indoor clay court tournament in the whole WTA tour. Three things are required to bring spectators and players into the right mood: technology, technology, technology. The centrepiece of the tennis show is the LED screen. It is a monster measuring 21 metres by 6.6 metres, it weighs five tonnes and it must be positioned at the head end of the Porsche Arena. It is controlled by an enormous mixing console which is housed in the box areas for nine days. The screen reproduces the action in the hall at the press of a button. Something is always on display, whether it is sports cars accelerating along twisting roads – mixed with the right sound, of course – or live interviews through to interesting presentations of the players. More than 100 additional floodlights above the centre court provide a light show which would turn any discotheque owner green with envy. Over three kilometres of cable ensure the smooth transfer of power and data for the light and video system. Add to this 100 displays distributed all over the two arenas so that passers-by can watch what is happening or read off the latest scores. While experts are installing and connecting the heavy equipment weighing a total of 20 tonnes, other workers are hammering, sticking, building and installing in the foyer. That is where the VIP lounge will be – a restaurant with a buffet where visitors can watch the cooks doing their job and around 700 guests can enjoy extraordinary cuisine every day. The live atmosphere in the culinary centre is provided by a specially installed exhaust air pipe that leads to the rear entrance onto Benzstrasse. There is also the large marquee where the 150 man strong kitchen and catering staff work. It is an enormous project which supports the excellent reputation of the Porsche event catering every year. Exhibition stands for the Sport & Lifestyle Village for about 20 exhibitors are dotted all around the freshly laid training court. A visitors' restaurant is built on the grandstand, providing a view over the entire scene. Wheels must engage within other wheels in order to keep the time schedule on track. In addition, 10,000 square metres of carpet must be laid, about 40 Porsche cars and museum exhibits must be placed in position and 250 signposts set up so that visitors can find their way around. Curic and his team keep an eye on everything and note down possible improvements for next year. Vjeko Curic: "Porsche wants to place the focus on the special quality of the brand and this also goes for the tournament." And the best thing always comes at the end. The tennis stars arrive on April 19 and 20 by plane and will make the final kilometres in a chauffeur-driven Porsche. By then the excavators will all have disappeared.